Missing teeth can be due to extractions following tooth shifting, a broken tooth or infections. 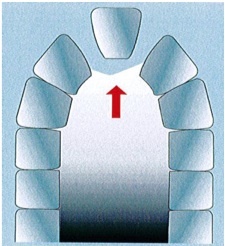 Dental arches are similar to architectural arches: if you remove one stone, the roof collapses! If one tooth disappears, the neighbouring teeth are not contained anymore, so they start moving, creating spaces where bacteria settle, creating cavities,pariodontal diseases and teeth shifting. With time, these neighbouring teeth will also fall off if the missing teeth is not replaced. Therefore missing teeth MUST be replaced as soon as possible. The associated bone loss can create an unbalance. This unbalance in turn creates anormal tensions and loosening on the face and neck muscles. This can explain gradual appearance of facial and cervical pains. It also explains why toothless people seem to age more quickly than others. Lips sink and the chin moves towards the nose because of the lack of tonus required to maintain the delicate balance of facial morphology.